I do believe spring is finally here. I see the unmistakable signs everywhere. Trucks are dropping off nursery stock, perennials, spring veggies, and cool season annuals every day this week. 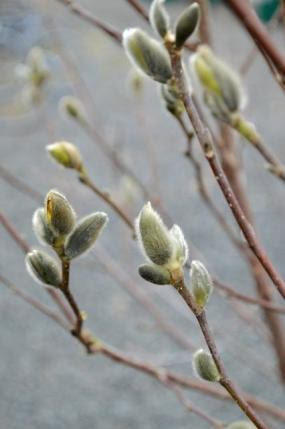 On Sunday I heard peepers and watched the buds swell on the maple tree in my yard. ByMonday, the Virginia bluebells were poking sprouts up in my courtyard. I would go inside for an hour and when I came back out, bulbs would not only be up, but flowering! 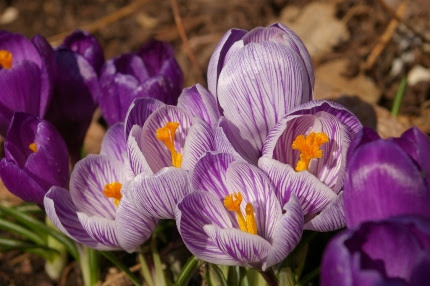 I took so many pictures of my crocuses. The honeybees found them immediately. I took this picture on Easter Sunday morning! I am excited to announce that our Saturday Morning Garden Walks begin this week and will continue until the end of October. For anyone who is new to Natureworks, these are FREE and you don’t have to pre-register, just show up. Many are themed, some are what we call “Back to Basics” which are unscripted rambles through our demonstration gardens. Some Saturdays we invite guest speakers to join us which makes it even more fun. Always check the Calendar of Events in our weekly email or on our website to confirm what’s going on each weekend. In fact, we will be offering walks, talks, and workshops on many Thursday evenings and Sunday afternoons as well. We have a LOT of very special events planned for the 2015 growing season. Epimedium flowers emerge very quickly in the spring. Cut back last year’s foliage NOW. This Saturday morning I will be demonstrating how to cut back perennials and summer blooming shrubs. 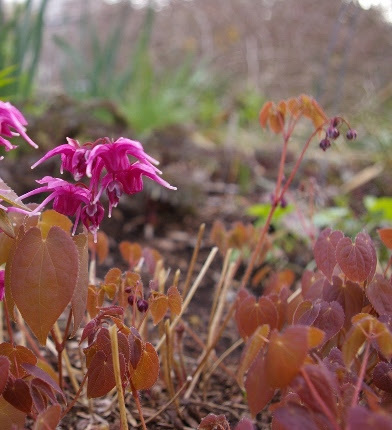 The FIRST thing you should do if your gardening time is limited is cut back any leftover Epimedium foliage. 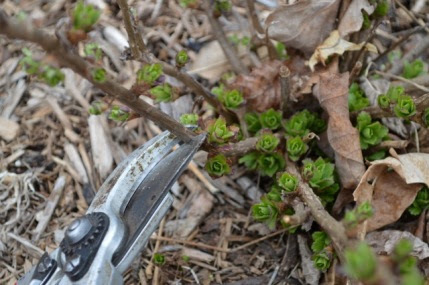 The buds are already starting to emerge from the crowns and if you wait, you will have to do it very painstakingly by hand instead of in a couple of quick swipes with your garden sickle. You should also cut off all of last year’s Hellebore leaves- the new ones will look so much nicer. Cut back Montauk daisies, Liriope, and ornamental grasses now. I will also be demonstrating how we feed the garden using our “Magic Formula”. Check out the article on the left for all the details on feeding the spring garden. Yes, all of our composts and organic fertilizers are in stock and ready to be loaded into your trunk! 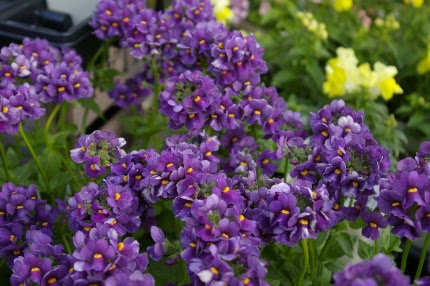 Nemesias are just one of the cool season annuals that are arriving this week. 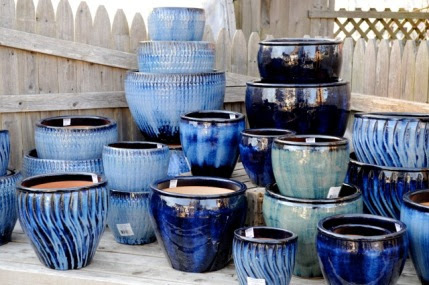 Plant your pots this weekend! Montauk daisies are sprouting new growth. Cut them back now. This Saturday morning is also the first of our monthly Early Bird Sales. We open at 7 am and Jane brews up some organic coffee. If you arrive between 7 and 9 am you get a $5 gift card. This weekend promises to be really nice so take advantage of this once-a-month happening. I am on the opening shift and it’s a nice time to shop before it gets too crazy and crowded. 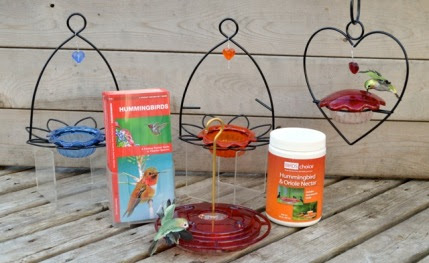 Now is the time to prepare for the arrival of hummingbirds. The migration north has started. Click here to see the map of where they are at this point! You want to get your feeders out and ready before they arrive which will be in 2-3 weeks. Hang more than one feeder out of sight from the other to deter territorial males. 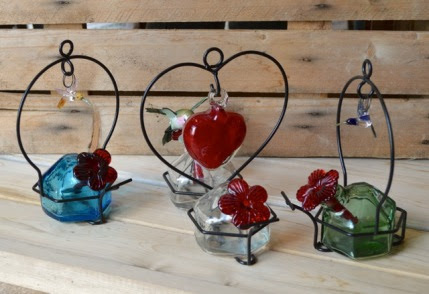 We have so many hummingbird feeders to choose from this year. I plant lots of flowers to feed the hummingbirds and lure them close to my deck and kitchen window. This year I am finally getting feeders as my husband is now totally into feeding the birds and will be willing to add the sugar water and clean the feeder on a regular basis. It is a ritual for us to sit on the deck, sip a glass of wine, and watch the hummingbirds. 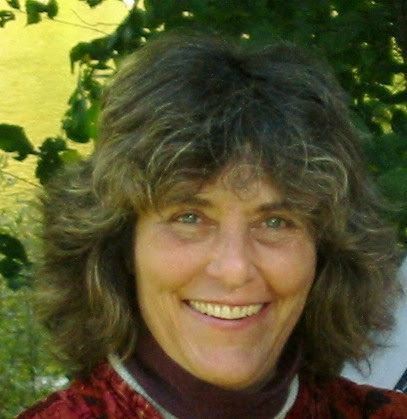 It slows us down and makes us simply sit and BE in the present moment. It’s amazing what we see! The earliest flowers for the hummingbirds that you can plant include coral bells, azaleas, fuchsias, bleeding hearts, Pulmonaria, Ajuga, and quince. Guess what? Many of these plants will be arriving in the next week or so, just in time. Some are already here. We have a great handout on Hummingbird Gardening. Click here to download a copy. 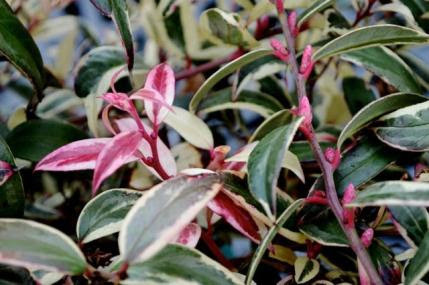 Leucothoe ‘Sparkle’ is a gorgeous new variety that just arrived this week! Before you jump full speed ahead into gardening, take my advice and stretch. Limber up your winter-weary body and work into it slowly. The first warm, sunny day that I have off I tend to overdo it and my body rebels. As I get older I realize how important it is to build my strength and stamina up over the next few weeks. Take breaks and plant up your pots or fiddle in your raised beds, sitting on the edge and sowing seeds. Every once in a while, stand up from your bending position and reach your hands up to the sky and reverse your position, stretching backwards. At the same time, you might just see birds flying across a bright blue sky. If you kept your head down for hours you would have missed them! New pottery arrived last week! P.S. Newsflash! 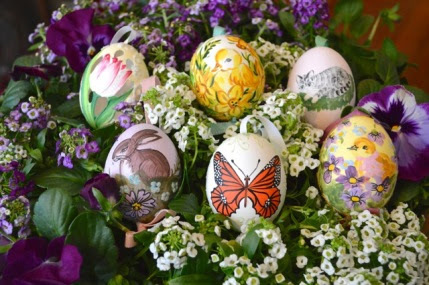 Diane just informed me that the hand painted Easter eggs and felt Easter ornaments are 30% off.